Tucked majestically beneath the verdant hills of the Southern Carpathian Mountains in Central Romania lies the historic charming city of Brasov, one of Romania’s most visited cities. Awash with gothic, barque and renaissance architecture, this once walled city is one of the loveliest cities in all of Transylvania. Brasov was founded on an ancient Dacian site in the 13th century at the crossroads of trade routes linking the Ottoman Empire and the rest of Europe. A thriving German mercantile community of skilled craftsmen enabled Brasov to dominate the economical life and importance of the region during medieval times. Beautiful churches and colorful buildings were built along with fortifications to protect the city against invaders. Parts of the 15th century wall still exist as well as a couple of lookout towers. Today, Brasov remains a charming city to wander and explore, enjoying its stunning architecture, its delightful bohemian walking streets and mass of fabulous outdoor restaurants and cafes. It is also an excellent launching off point to many hiking trails and day trips to medieval castles in Transylvania. I found Brasov delightful and the perfect place to base ourselves for the majority of our stay in Romania. We arrived around mid-afternoon after a relatively straightforward three-hour drive south from Bucharest. Quite frankly, getting out of Bucharest took the longest and was the most difficult part of the drive given its swath of roundabouts and signs in Romanian. Thankfully we had GPS in our rental car or else we certainly would have gotten even more lost than we did. As you leave Bucharest, you pass through the surrounding Romanian countryside a place of tranquility and beauty. In the Middle Ages, Romania was made up of three principalities: Wallachia, Moldavia and Transylvania with Transylvania inspiring the most legends and mystique. For it was here in Transylvania that the lore of Dracula began and it is easy to see why given the number of castles, fortifications and medieval towns. Approaching the city of Brasov which is located down in the valley surrounded by mountains. We based ourselves at the lovely Hotel Kolping located about a ten minute walk up above the city, in the mountains. It served as the perfect place to stay as long as your wore ear plugs at night or are a sound sleeper. (There is a bit of noise at night from the barking dogs trying to ward off the bears coming down from the mountains for a midnight treat). But despite the noise, the hotel is lovely with an incredible view of Brasov, a wonderful friendly staff and excellent food. When we first arrived in Brasov, it was overcast, gray and gloomy yet I still found it quite lovely nevertheless. There would be a day or two of rain followed by perfect, cloudless days. In my option, the grayness captured the romantic mood and sense of mystery of Brasov. It was also great weather for doing a do-it-yourself walking tour which takes only a couple of hours. We first went to the Council Square (Piata Sfatului) which is the heart and soul of Brasov, and one of the most beautiful squares in all of Romania. The street is lined with stunning red-roofed merchant homes which once belonged to the Saxons who built these homes in medieval times. The most notable sight to see in the square is the famous Biserica Neagra or “Black Church”. The Black Church was built from 1383 to 1480 and is the largest Gothic church in all of Romania. 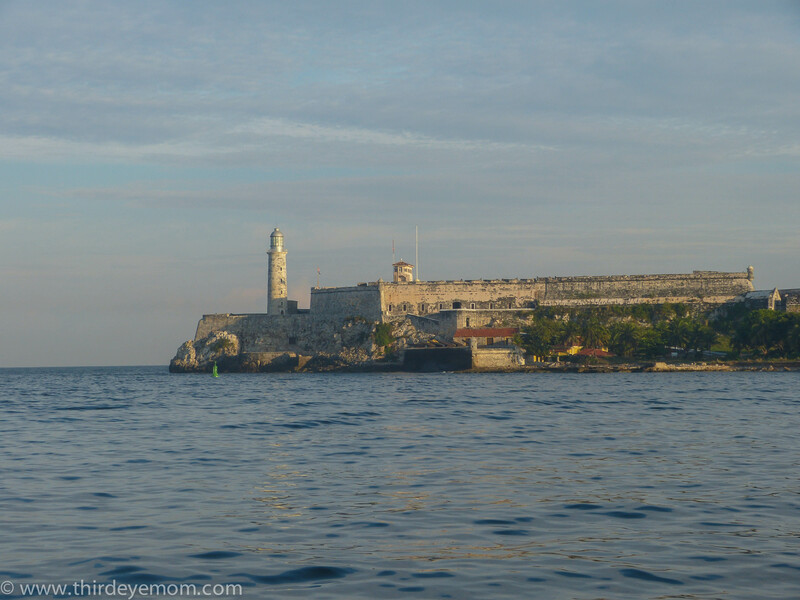 It received its name due to the effects on its appearance after a fire damaged it in 1689. The inside of the Black Church can be toured however no photographs are allowed. The church can be seen from miles away and is especially magical viewed from above on Mount Tampa. After touring the church, the winds came in and swept away the rain clouds. The sun appeared and shined down on the square illuminating its buildings and bringing Brasov to life. Families were out playing with their kids by the fountain. Couples were walking hand in hand. People were enjoying a cool drink at one of the many lovely outdoor cafes in the square. Meanwhile I was taking pictures of the lively, colorful buildings that lined the square and were even more brilliant with the afternoon sun. What I loved most about Brasov was its bohemian, laid-back feel. For a town of its size, I was amazed by how many excellent outdoor restaurants and cafes there are in Brasov. We found several that we thoroughly enjoyed. The only difficult decision was deciding where to eat! Also compared to other European countries, the prices in Romania are extremely good. 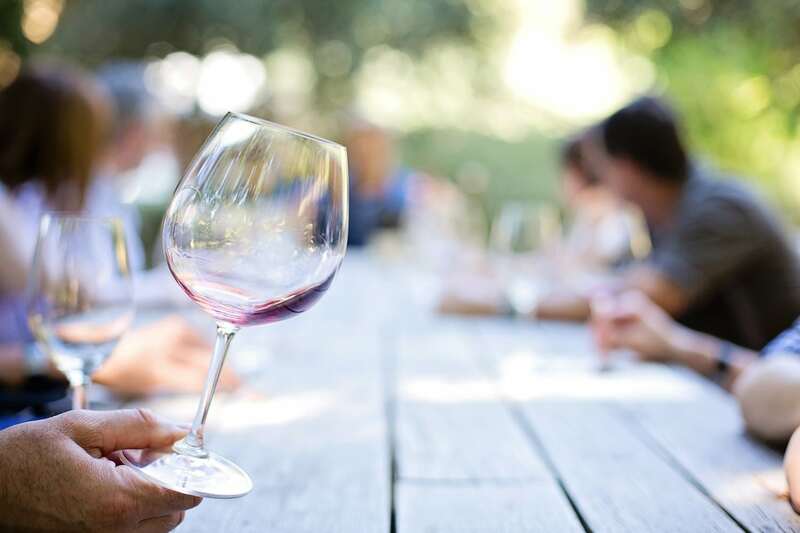 We were able to have a three-course home-cooked meal with a bottle of Romania wine for under $25. Brasov is a great city to spend time just wandering its cobblestone streets and soaking in the character and charm of the city through its elaborate buildings and facades. Some were beautifully restored and immaculate while others were in need of renovation yet still had a story to tell through its layers of peeling paint. You can also hike or take the tram up to the top of Mount Tampa (where the Hollywood-like Brasov sign is above) for a bird’s eye view of the town. We opted to take the 1960s Communist tram up and hike down. The views were absolutely spectacular and worthy of a post all in itself. As I often do when traveling is make sure to look up. I thought about all the history that I’d witnessed in just a short time in Brasov and without the crowds that are common in so many other parts of Eastern Europe. It was lovely! We spent five days in Brasov using it as our base for exploring Transylvania. Within that short amount of time, I easily fell in love with Brasov’s unique beauty, charm and liveliness. I would go all the way back to Romania just to spend more time in this lovely town with its friendly people, beautiful architecture and relaxing feel. No trip to Paris would ever be complete without a visit to the beloved Cathédrale de Notre-Dame. Built between 1163 and 1345 the Notre Dame has withstood centuries of history and is one of the most iconic cathedrals in the world. Not only is the Notre Dame a pure masterpiece of French Gothic architecture, it has also remained the city’s heart and soul for centuries of dynamic struggle and change. 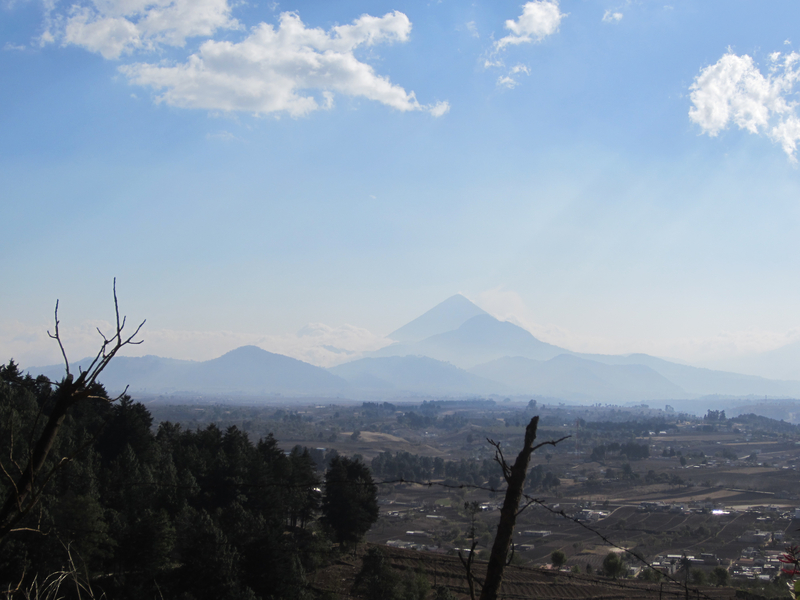 View of the grand Santa Maria volcano off in the distance as I was leaving Xela via shuttle on my way to Antigua. There are things you’ll experience in Guatemala that will stay with you forever: the smell of a freshly grilled tortilla; the assault-on-all-senses of a jungle trek; the people you bump into on the road and become lifelong friends…..In the west, a volcano looms on almost every horizon, almost begging to be climbed. (Opening lines in the introduction to Guatemala, Lonely Planet 2010). It was with these words, “almost begging to be climbed” that I joyously opted to skip my already-paid for Spanish class on Wednesday and wake up at the break of dawn to climb Guatemala’s fourth highest volcano, Santa Maria (elevation 3772 m/12,375 feet). It didn’t matter that I was utterly exhausted nor that I didn’t have the right gear. All that mattered was there was an enormously, inviting volcano begging to be climbed. There was no way I wasn’t going to climb it. 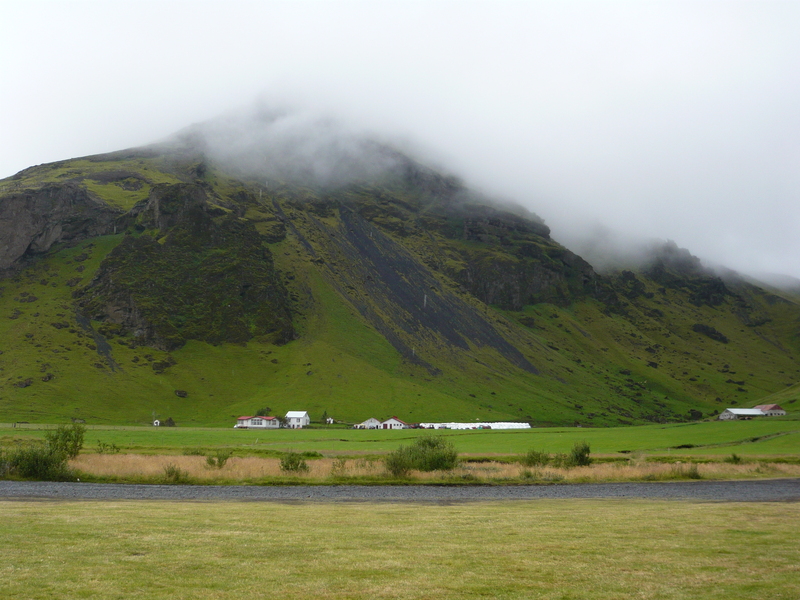 Heading northeast on Iceland’s famous Ring Road instantly reminded me why I had always dreamed of visiting…. Ok…I lied. I was initially going to write my next post about intimate, eccentric Reykjavik, a city of only 120,000 or so hearty souls, yet on a whim I changed my mind. I took one look at my pictures from my first Icelandic adventure, ice trekking on a real, live glacier, that I felt I couldn’t contain my desire and thrill to write about this adventure first. So, lovely, playful Reykjavik will have to wait. Prepare yourself for a real glimpse at why Iceland is known as the land of fire and ice, and why the wild, stark dramatic beauty of this amazing country enraptures one’s heart and soul and makes any visitor immediately promise to come back again. 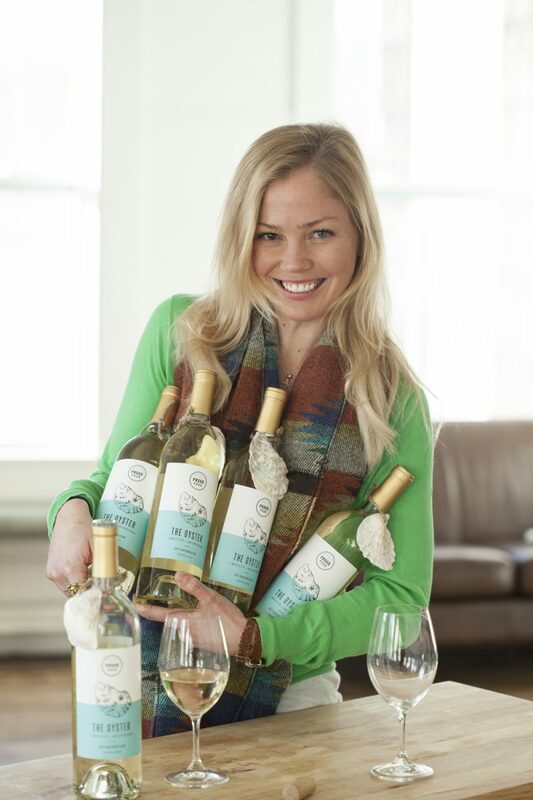 Hold on tight…..and hope you enjoy the ride! The geography of Iceland is absolutely amazing. Despite its long history of Vikings and Sagas, it is actually a geographically young country that is still forming. 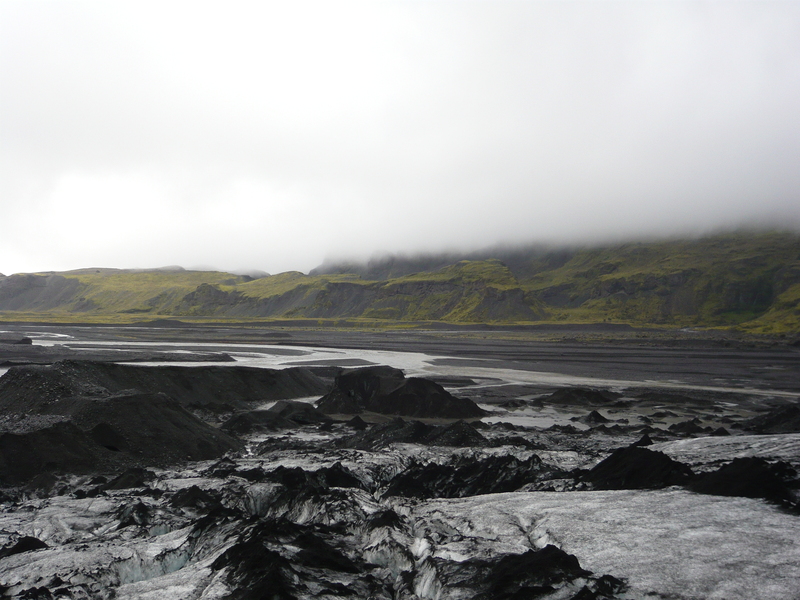 It contains some of the largest glaciers in the world (glaciers cover about 10.9% of Iceland’s total landmass. 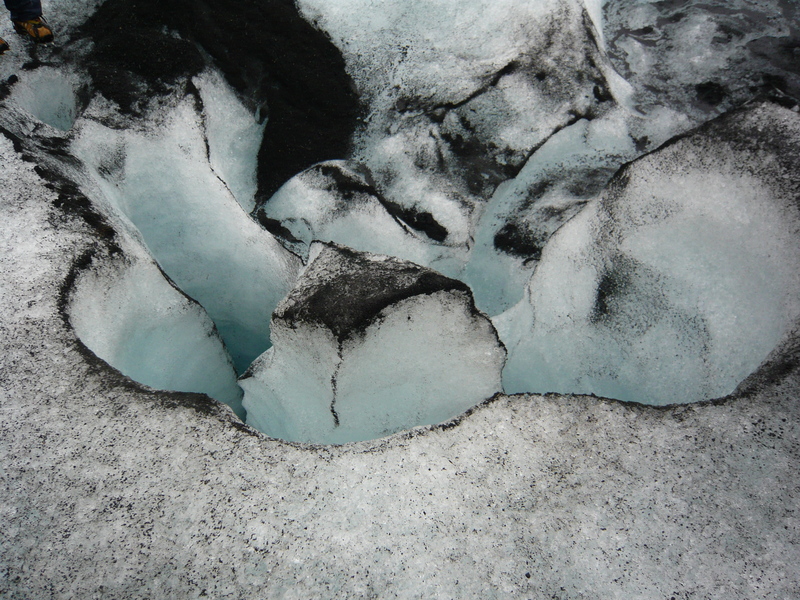 There are over 4,328 square miles of active glaciers). 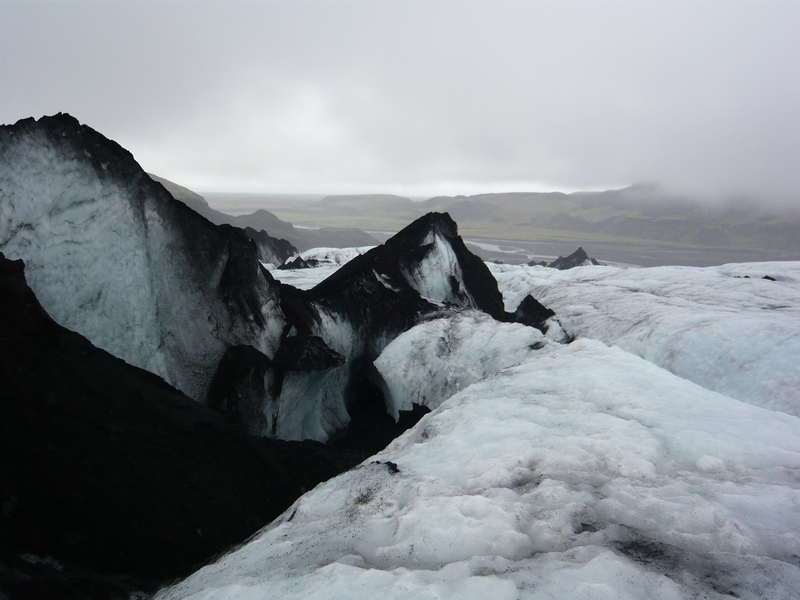 Three enormous glaciers represent 11% of the entire ice mass: Vatnajökull, Langjökull and Hofsjökull. These glaciers are so incredibly huge, that in the winter time Icelanders get out their Land Cruisers and actually drive across them for fun! 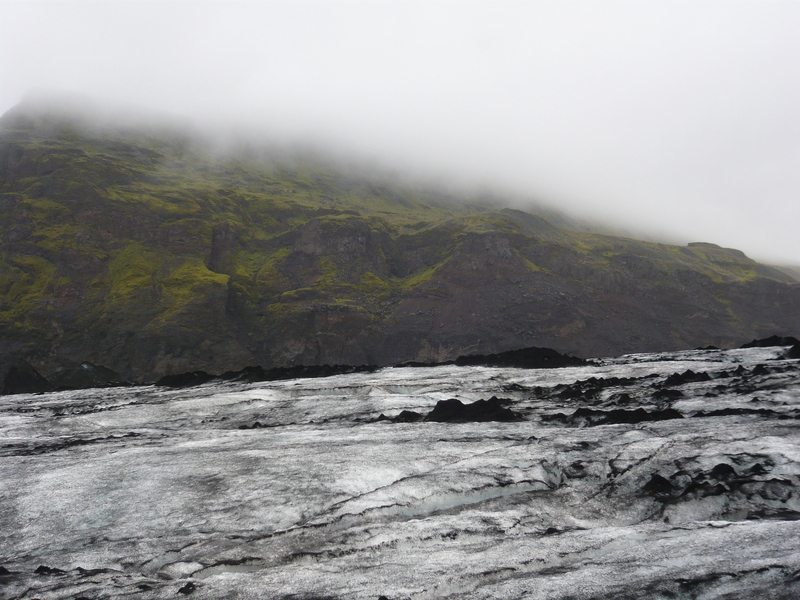 Iceland also has over some of the most active, turbulent volcanoes in the world. There are over 200 post-glacial volcanoes (over 30 of them have erupted since the country was settled in the 9th century AD, per Volcano Discovery (for more information, check out their volcano website. 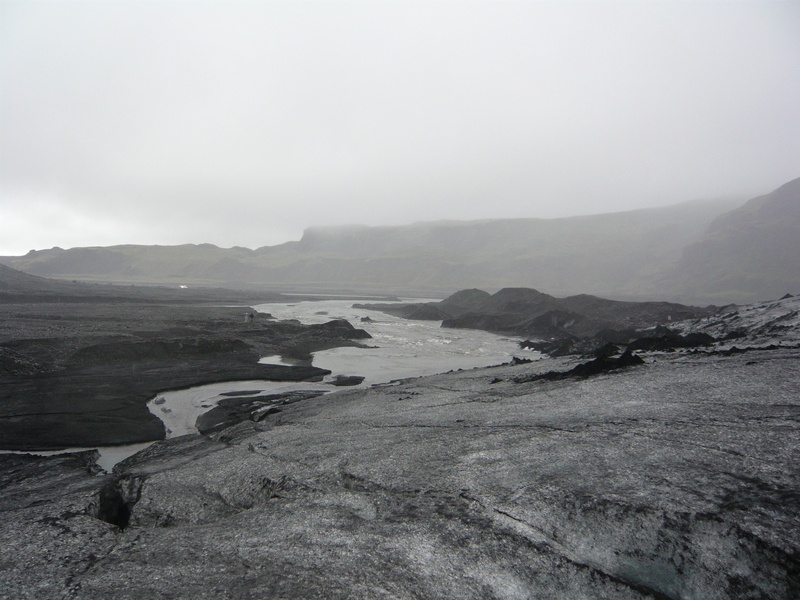 Recent volcanic eruptions in Iceland have caused airport closings and chaos throughout Europe. On May 25th, The mighty Grímsvötn volcano erupted and wreaked havoc, just a little over a year after the powerful eruptions of the now world-famous Eyjafjallajökull volcano. Besides volcanoes and glaciers, Iceland also prides herself in having the richest source of hot springs and geo-thermal activity in the world. There are steam holes, geysers, bubbling mud holes and sulphuric precipitation. Many Icelanders are known to hike to the top of a dormant volcano, swimsuit on and towel in hand, to take a dip in the hot, natural spring pool at the top of the mountain! There is also the infamous “Blue Lagoon”, probably one of the largest, geothermal pools in the world where Icelanders and tourists alike bathe ensemble, coated in mud masks, drink beer and watch the world go by. Iceland’s interior is uninhabitable; it is covered with glaciers, mountains and high plateaus which makes the support of any life impossible. Therefore, all Icelanders live along or within easy reach of the coast. A long, curvey group of roads circles the island. Although we didn’t make it all the way around, I was amazed and surprised by how much the topography and geography change. 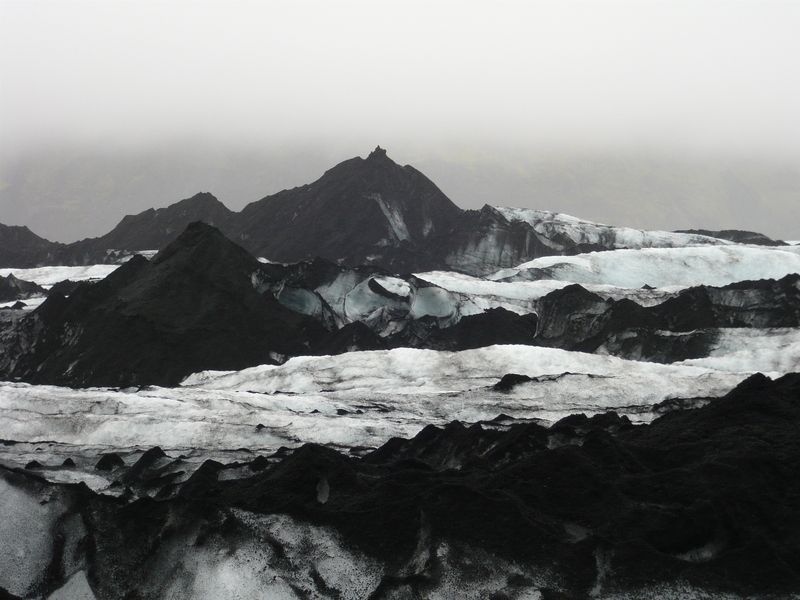 There are endless amounts of things to see and do in Iceland, especially for the adventurous souls, which leads me to the topic of this post: A Day of Ice Trekking in Myrdalsjökull Glacier. The Myrdalsjökull Glacier is the fourth largest glacier in Iceland and is located about 96 miles southeast of Reykjavik. Several adventure outfitters take the curious, adventurous and willing traveler on a full-day trip from Reykjavik which is pricey, but in my opinion, the best way to experience Iceland’s ice in the raw. Here are some pictures from this epic, adventurous day. Hope you enjoy! 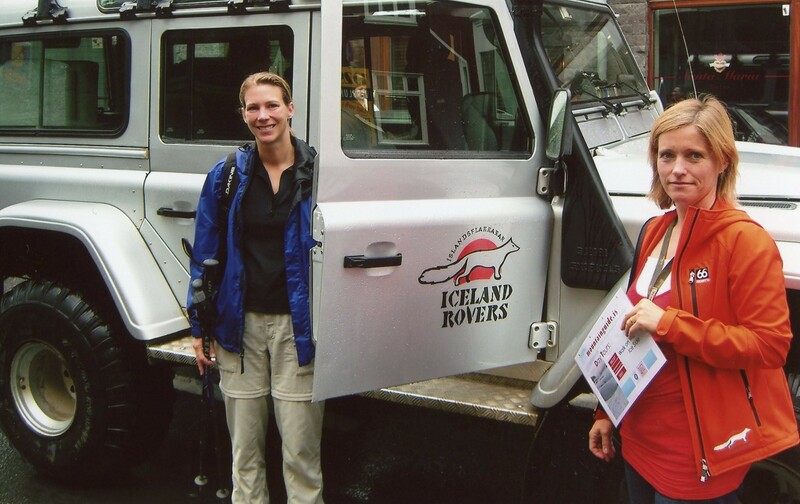 Setting off early morning with the tour operator who of course drives a Land Cruiser, Iceland’s favorite vehicle! I chose Icelandic Mountain Guides and they were terrific. As the drive continues, the scenery never ceases to amaze me. It is God’s Country, a land so green and so beautiful that it almost hurts your eyes. You pass through many small towns by the sea, farms loaded with white fluffy sheep, horses and hay, and nothing but green. It is absolutely spectacular. The beauty is stark, raw, mystical and unique. Iceland is like no place I’d ever seen. It is like no place on earth. As we approached the glacier, I was curious about when I’d first be able to see it as the size and mass of Iceland’s glaciers is literally incomprehensible. They are that big. Unfortunately the weather began to change. The clouds set in like a giant blanket overhead and rain began to fall lightly across the greening grass. 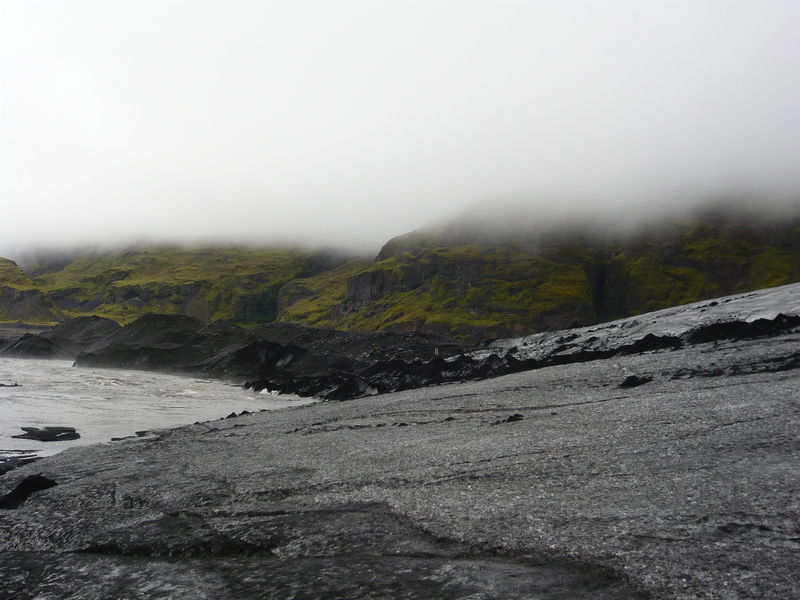 We arrived at the Myrdalsjökull Glacier shortly after our visit to the waterfall, just as the rain began to change from a drizzle to a downright pour. Thankfully I was prepared. 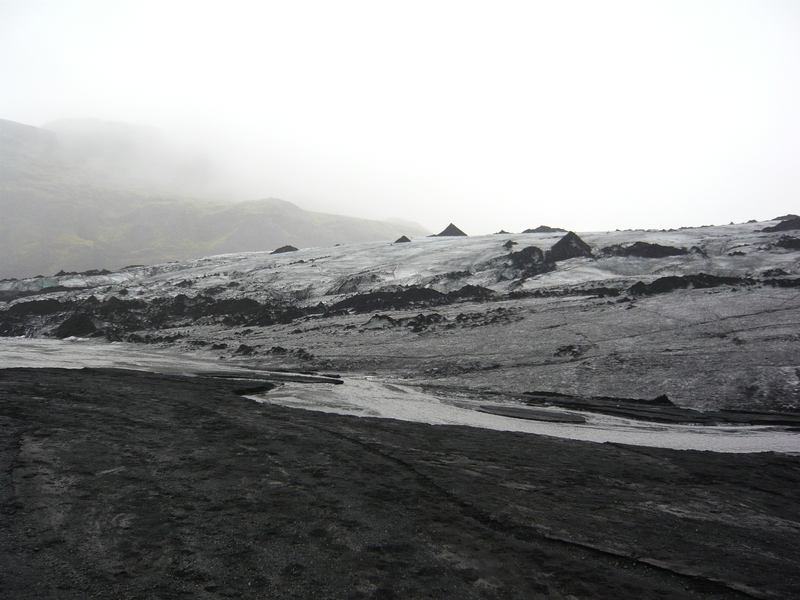 I packed all my Gortex watergear which would definitely come in handy as we hiked the massive Myrdalsjökull Glacier. 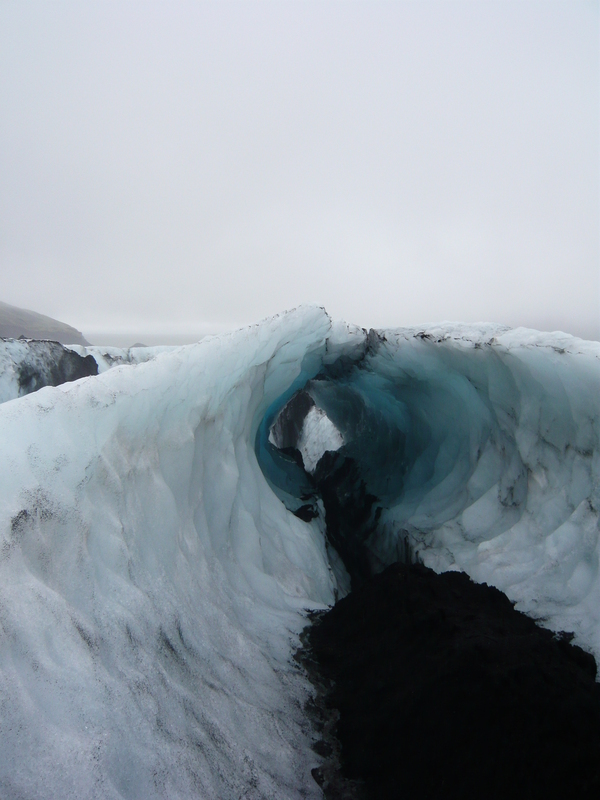 The tongue of the glacier…there is no way possible to show the enormity of it! 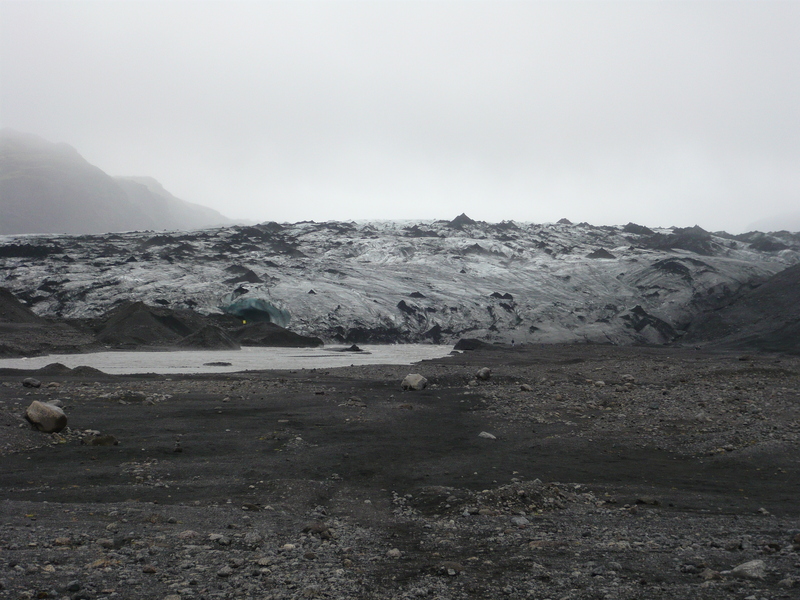 The entrance to no man’s land…..
We get on our crampons in the pouring rain and set foot onto the glacier. I’ve never walked on crampons before and we get a brief instruction on the techniques. I felt like a penguin, it was hilarious, but once I got used to it, it was actually quite fun and such an amazing way to see the glacier. 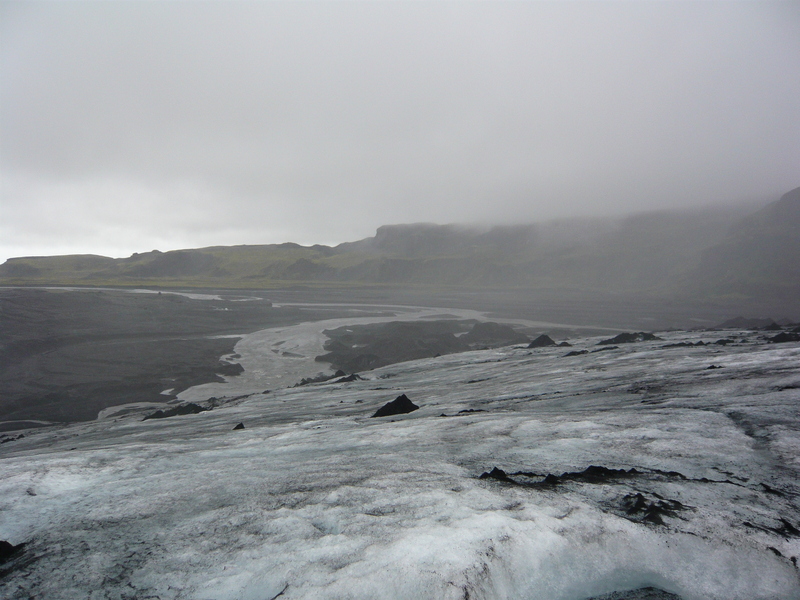 Here is a photo from on top of the glacier: The terminus of the glacier ends in a tiny pool of water and a river. 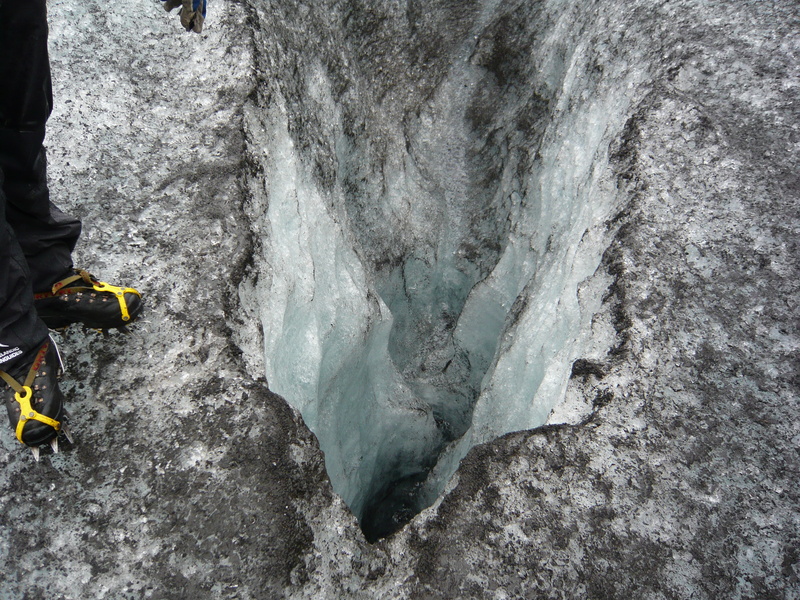 We see our first 100 foot crevasse. Wouldn’t want to fall in there! But the colors of blues are so intensely beautiful…. The clouds and rain set in and then the wind picks up speed and it was FREEZING, WET and MISERABLE! But we were walking on a glacier so what could one expect? The stark beauty of the place felt like no place on Earth…. The rain still is pouring and I am freezing cold…yet the thrill of walking on ice from before mankind felt surreal. And the colors of contrast between the dirty, ancient ice juxtaposed against the verdant green fields was spectacular in itself. After 90 minutes of walking in severe wind and rain, we headed back to the terminus of the glacier and thankfully climbed into the warm, dry bus that will take us back to town. 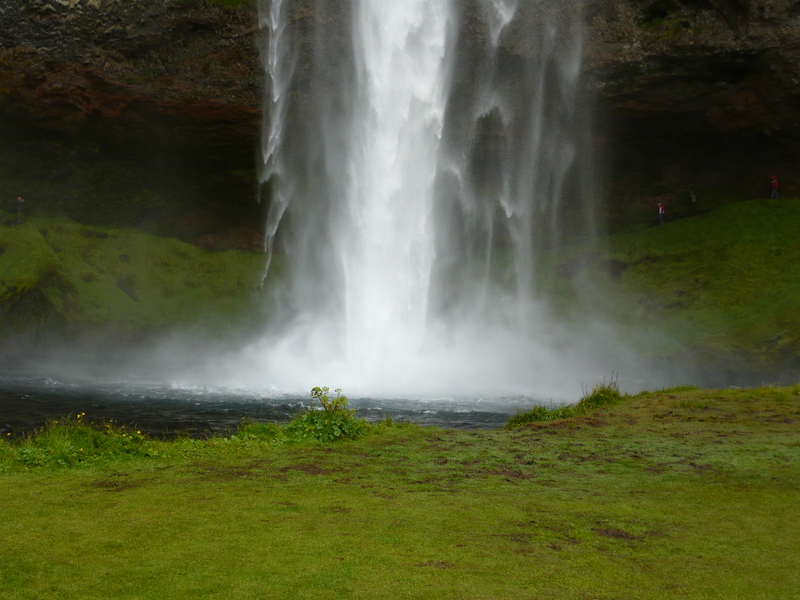 It was an experience I’ll never forget….to be completely lost in Iceland and wandering….”Is Anybody Out There?” (A popular quote sold on t-shirts, mugs and postcards from Iceland). After being there, I understood what this quote was all about! I chose Icelandic Mountain Guides who have a ton of cool tours. Check them out here. Be sure to pack waterproof clothing and lots of warm layers! It was freezing cold out there on the ice!